Organize your receptions for all type of demonstrations: seminaries, marriage, associative demonstrations, concert in the ancient park of the family castle of Rochefoucauld. 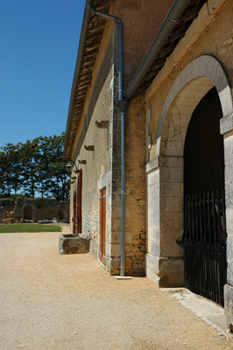 This barn is part of ancient stables and gives an exceptional space . Big courtyard closed in front of, giving an ideal space outside reception (aperitifs), or open-air concert. Decorated with horses coach of the family, the barn by its volume assures you an unique decor in a very privileged and private space.